It was the summer of 1980 and I had just purchased the stereo for my car. It was not just any stereo, it was a Pioneer in-dash AM/FM cassette player. It came with pioneer speakers and I added a 100-watt power booster. The power booster had a plug-in for a microphone so you could sing along which for some reason attracted a lot of passengers so we could all sing like rock stars. I was proud of the new equipment in my car and told all my friends about purchasing it in Kansas City and buying several cassettes to play, along with a cassette case. After cruising for a few miles I decided to listen to the “Cars” or “Cheap Trick” or “REO Speedwagon” and grabbed for my cassette case. It wasn’t in the front seat. I checked the floorboard and then pulled over to investigate further. It was not in the car. I turned around and headed home to see if I left it there. I checked my house and nothing. After that, I figured one of my friends had pulled a prank on me. Nobody owned up to that. The last thought I had was that someone had stolen my cassette tapes but apparently they had. I had left Tom Petty and the Heartbreakers in the player and the idiot took the cassette tape case for the cassette, but no cassette (plus the thief had about $50 in cassettes). So for the next few weeks, I played Tom Petty and the Heartbreakers almost every time I went somewhere. I memorized the songs. I still remember them today. It was a few weeks until payday, so it was Tom or the radio. I’m kind of a hoarder when it comes to music. I have hundreds of 45s, plus a crate full of albums that range from AC-DC to the Rolling Stones. I have many CDs, too. Plus, I have a plastic storage container full of cassette tapes which fell over the other day when I was doing some spring cleaning. Guess what fell out? Yes, “Damn the Torpedoes” by Tom Petty and the Heartbreakers was in the box and I thought there was a story there. 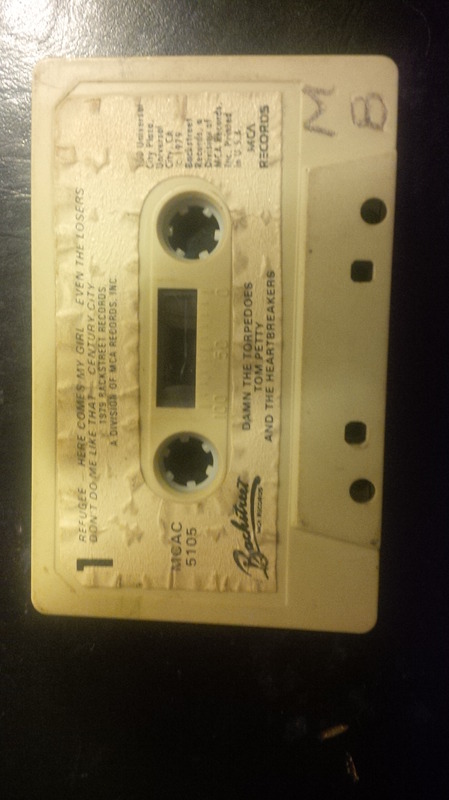 That cassette survived theft, my younger years, and my years in the military, which all adds up to about 34 years! Although a little squeaky, Tom Petty and the Heartbreakers still played! You can see it is well-worn and in the corner it has “MB” engraved in case some sucker decides to steal it! Rest in Peace Tom Petty. Your music will live forever. This entry was posted in Current Events, Music and tagged Damn the Torpedoes, Pioneer in-dash AM/FM cassette player, Refugee, Tom Petty, Tom Petty and the Heartbreakers by Jackie M. (Mike) Brown. Bookmark the permalink.